« How on Earth Did This Happen? It was way back in 2009 when I published my first post on the abuse of Lincoln Park by several local institutions and terrible management by the City of Los Angeles. That post, entitled “Campaign for a Car Free Lincoln Park, Pt. 1“, along with a couple of follow-up posts and videos did result in some positive changes in the park. One problem that has persisted, however, it the abuse of the park’s lawn by patrons and employees at Plaza de la Raza. Instead of using the available curbside parking (which used to be restricted during peak hours, but now is open to the public), and instead of using the newly paved and re-striped parking lot on Selig Place (which used to be abused as shuttle bus storage by nearby El Arca, Inc, but is now open to the public), instead of taking the bus, or riding a bike, or walking; instead of any of those options the patrons and employees of Plaza de la Raza drive directly inside the park and use the lawn to store their vehicles. Is this illegal? Yes, it is. Former councilman Ed Reyes erected an “Authorized Vehicles Only” sign at the entrance being illegally used by Plaza patrons and staff – but somehow the sign never did its job (big surprise). 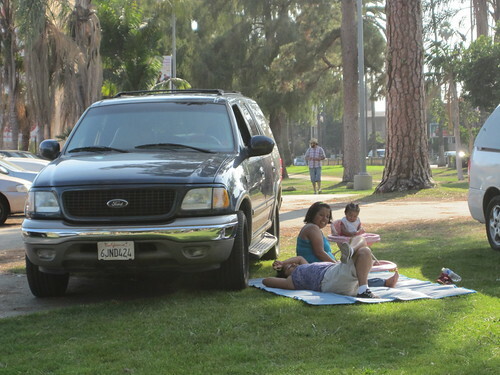 With a new councilman in office, one Gil Cedillo (despoiler of bike lane plans in Council District 1), is change going to come to the abused landscaping and park space at Lincoln Park? Cedillo’s endorsement list for his city council run in 2013 includes the name of one Fredy Ceja, President of the Board at Plaza de la Raza. Since being elected in May of 2013, abuse of the park has continued unabated. So, along with being anti-bike, Councilman Cedillo is strongly pro-cars-in-the-middle-of-parks. How can this be a winning strategy for local office in Los Angeles in the 21st Century? Councilman Cedillo is up for election in 2017 – so it’s at least 3 more years of LA’s new patron saint of pollution and car-dominated, unsafe, streets and shattered communities. 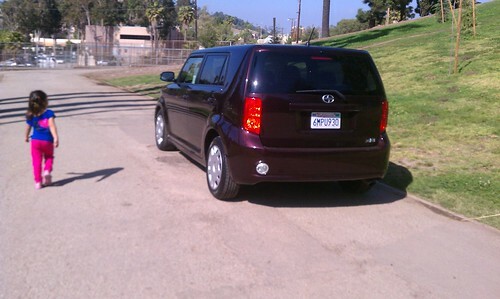 Go for a drive on the lawn and foot paths of a local Los Angeles park today! Councilman Cedillo will be there in spirit, smiling, as you turn the last refuge of neighbors desperate for relief from the freeway-throttled asphalt hell-scape local streets into another symbolic offering to the gods of combustion engines.